Morning... I'm back after a few days off, mainly because my craft room is still a mess from my purging and mega sorting, labeling etc (which is no where near finished) so I am trying to finish that in spare time rather than craft so it is done once and for all. The craft room move has been an epic adventure, but I have so much (too much) stuff and it really needs sorting and a mega destash. Today I do have a card for the new Lili Of The Valley Facebook challenge which you can find here! This month the challenge is Anything Goes, a nice easy one for you. 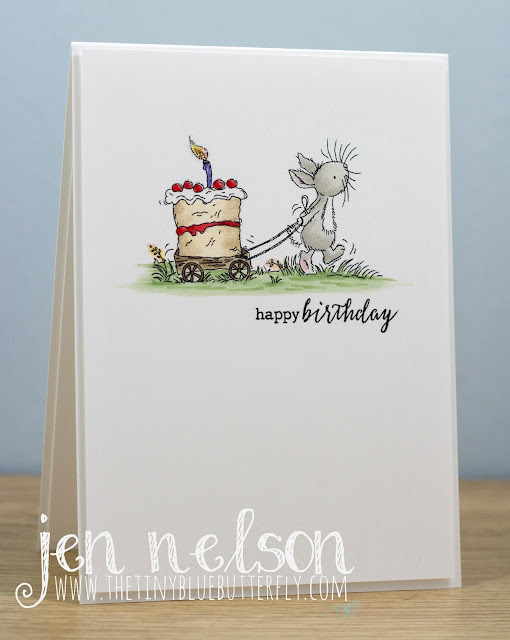 I have used the super cute Cream Cake and shrunk it down in word to give you a very CAS card... I love it!! So fun and cute Jen.